What happens when you take a two-player arcade stick configuration and merge it with a trackball? 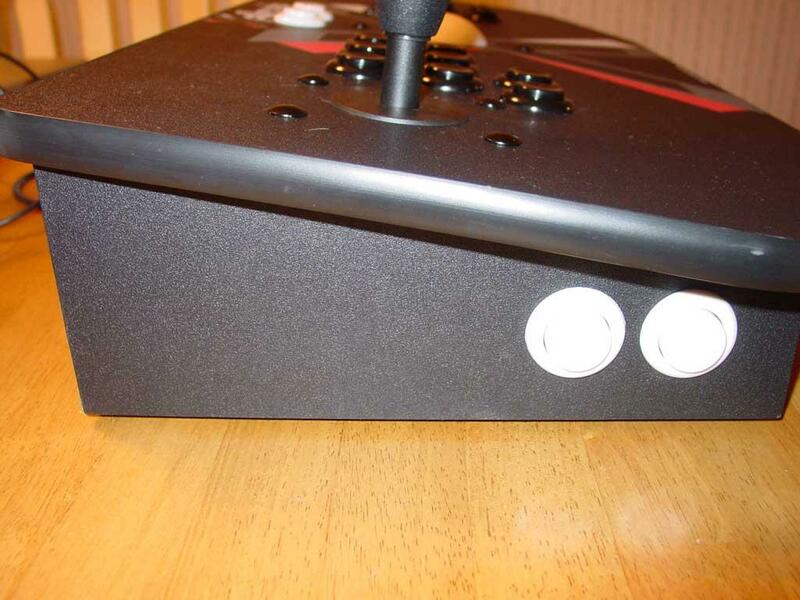 X-Arcade has done that with two of their great products and what they got is dubbed the TankStick. Does the Tankstick live up to the previous X-Arcade products? Of course it does! 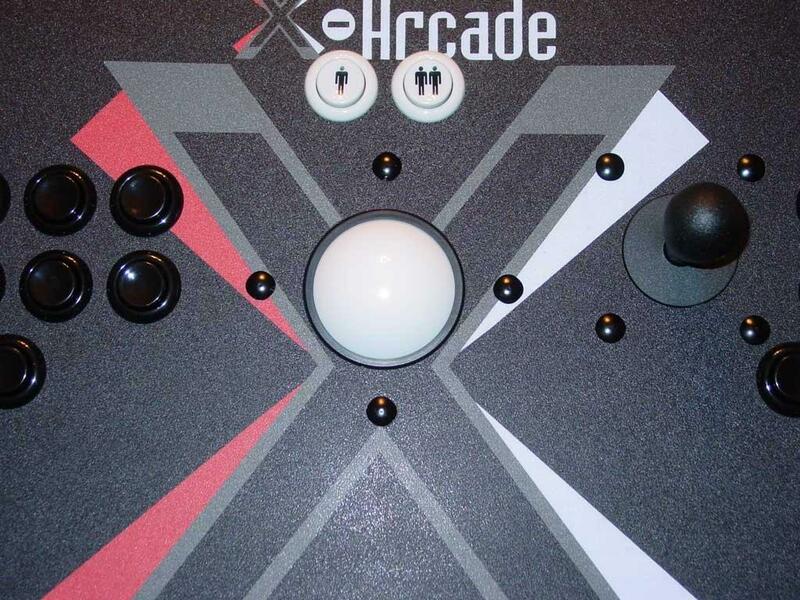 I reviewed X-Arcade's original setup many moons ago and it wasn't too long ago I reviewed their trackball. But for those that want it together, this is the setup you want. Let's start by going over the traditional stick area. The setup for the stick portion of the unit should appeal to most retro gamers. 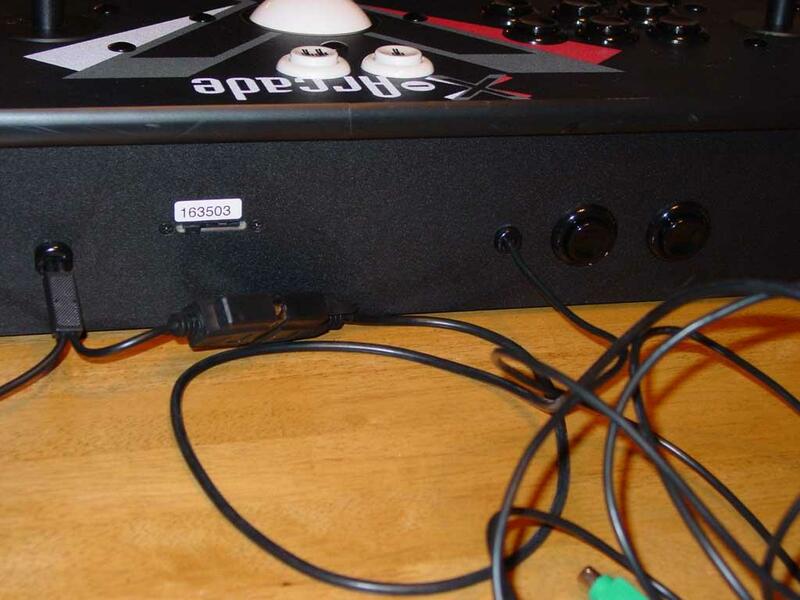 Each player's side consists of one stick with eight buttons configured with two rows of six and one row of two. The configuration should be enough for most games and if you're a big fan of fighting games like me, then you'll appreciate the setup. If you're familiar with their dual joystick setup then it's pretty much the same for the Tankstick. The sticks click just like in the arcades. The buttons' feedback was strong and pronounced. It truly does feel exactly like an arcade machine but then again it should as it's using arcade quality parts. A red LED on the upper right portion of the unit lets you know that the product is active as well as give you other indications. You can adjust the sensitivity of the buttons and the joystick by removing the bottom panel and making minor adjustments to the switches or springs. Say you don’t play many fighting games but more of the retro Q-Bert, Pac Man, or Donkey Kong games. You really only need four directions as the diagonals aren’t used. Just pop open the bottom, move the arms away from the control stick, then you’re ready to go. But if you’re into fighting games and need that high sensitivity for diagonals, then just move the arms towards the control stick and it’ll be more sensitive to those directions. The buttons can also be changed to feel looser by adjusting the springs. In the middle top portion of the unit are two start buttons. Labeled just like in the arcade with one person or two, these two buttons will start the game for their respective side. For old arcade folks, this is also where the two buttons sit on most arcade machines as well. For pinball fanatics out there, the Tankstick features two pairs of two buttons on each side of the unit. The dual joystick setup only had one on each side but here you get two on each side. In MAME, you could use one of the buttons to put in the coins for the first player by using one of the left side buttons with the second player's coin button being one of the right side buttons. The unit's width makes it so that the side buttons do feel pretty natural when playing pinball games as it offers the same feeling as if you had your hands on either side of a pinball machine with your hand resting on top of the unit while your fingers hang off the side to press the buttons. Smack dab in the middle of the unit lies the trackball. For games like Golden Tee or Missile Command, the trackball mimics a mouse and gives you greater control over a cursor than a joystick. Like X-Arcade's trackball unit, the trackball on the Tankstick feels very authentic. I think I would've liked a little less friction on the trackball so it would roll a little easier and longer but for the most part the trackball worked great. Yes it can double as a mouse so if you don't want to plug in a mouse to move the cursor on screen you can just use the trackball instead. A left pinball button works as a left mouse click while one of the right pinball buttons works as a right click. Like the X-Arcade trackball unit, the Tankstick has a button on the back where you can toggle the ability to only register vertical rolls with the trackball. It's a sort of cheat mode so you will be assured every roll is straight and won't deviate even if you roll at an angle. One thing I didn't like about X-Arcade's original dual stick setup was that I thought the two players had to sit a little close to one another to be comfortable. This has been address in the Tankstick mostly because more room was needed for the trackball in the middle. Thus, the width of the Tankstick has grown from 25 inches in the original dual stick unit to 30 inches in the Tankstick. The extra 5 inches really does give some much needed elbow room and makes using this unit in a two player setup more comfortable than the original dual stick unit. The mode switch located on the back of the unit allows you to program three different configurations into the unit with the fourth one being an unchangeable default setting. The Tankstick lets you program the buttons to whatever key press on the fly and save it even when the unit is unplugged. If you should find a game that's not supported or you want to change the setup without having to get out of the game, just use the dynamic programming feature. It's a great feature of this stick and one that's been carried over from their previous products. The dynamic programming offers the flexibility and freedom to setup your Tankstick the way you want to. Connecting the Tankstick is pretty simple. 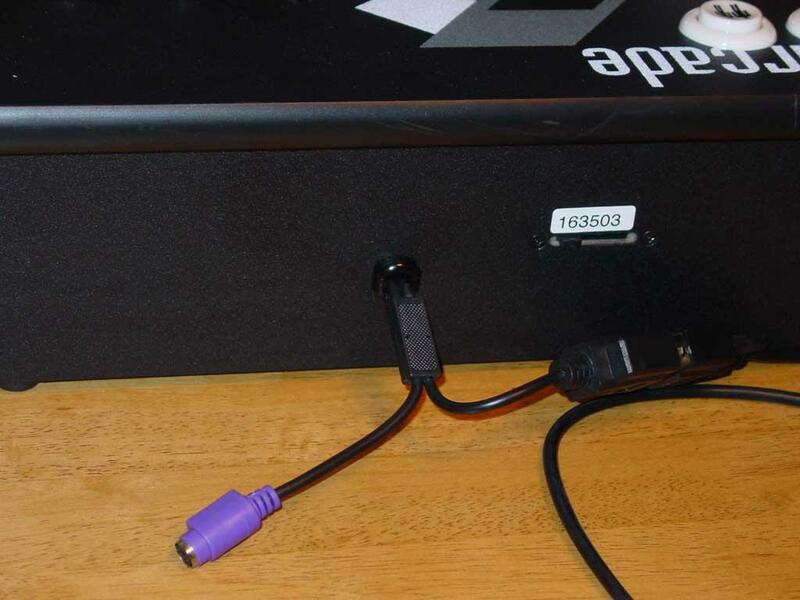 For PC folks, you just need to plug in either the two USB connections or the two PS/2 connections but not both. Yes, there are two cables that extend from the back of the unit as one's for the trackball and one's for the joysticks. I was able to plug the unit via USB and my computer was easily able to recognize it. Setting up MAME to default to the X-Arcade setup allowed me to use the unit with almost every game available without any further configuration. 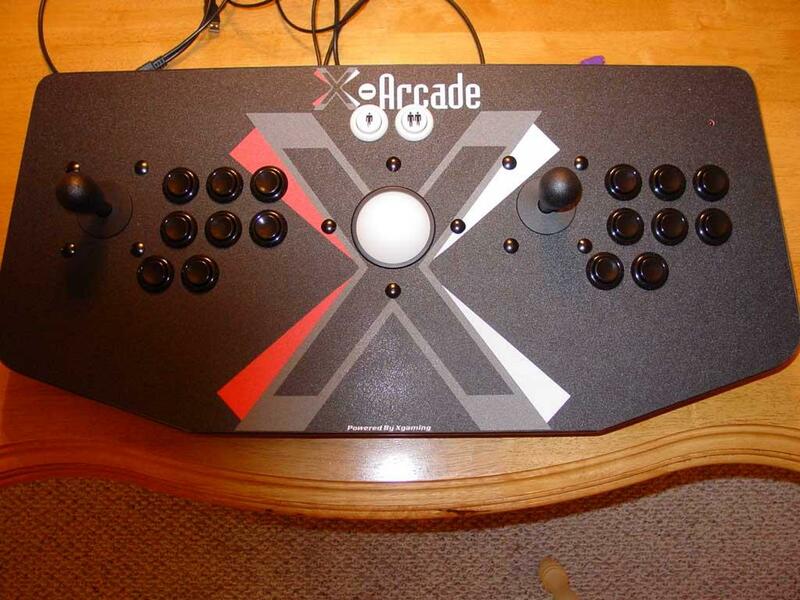 It's certainly an improvement over the first time I reviewed the X-Arcade stick as it was just PS/2 at the time. I was very pleased with how easy and quickly it was to setup and get going. If you do want to use the Tankstick with other consoles, you can purchase adapters from X-Arcade for the console you desire. On their website, they have adapters for the GameCube, Xbox, Dreamcast, and PlayStation 2. Mac users aren't left out in the cold as they have an adapter for you too. No Xbox 360 adapter yet, which is a small disappointment as this stick would be perfect for the retro gaming on the various Xbox Live Arcade titles. The reason being is mostly due to Microsoft's new policy and engineering on their controllers so I hope it gets cleared up soon so that X-Arcade can come out with an adapter to make this the ultimate 360 arcade peripheral. The unit's built tough with heavy duty wood and arcade quality parts. Since it's made to take a beating, the shell is crafted from thick wood making the unit weigh in at about 20 lbs. Arcade quality sticks and buttons makes it so this unit stands up the test of time. From pressing the buttons and moving the joystick around, each part feels exactly like how it does if you went into your local Gameworks or Dave and Busters and sat down at one of their machines. Should one of the parts in the Tankstick go out, you don't have to go through X-Gaming to get it replaced. 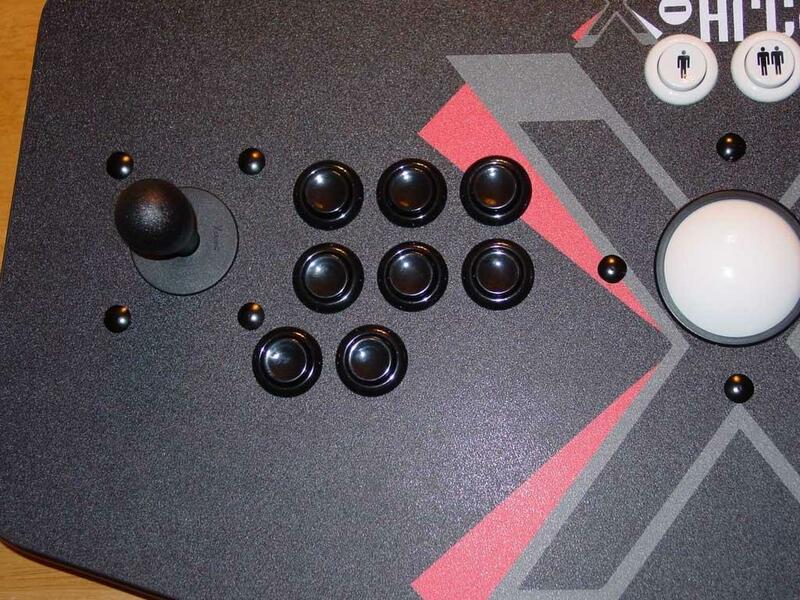 If you have a local supplier of arcade parts, you can just pick one up from them and replace it in the Tankstick. I'm glad to see X-Arcade not trying to lock you into their parts for replacement but you may purchase them through X-Arcade if you want to as well. Best of all, the Tankstick comes with a lifetime warranty. Should anything go wrong X-Arcade will fix it, send replacement parts, or send you a new one. You really can't beat that and it's one aspect of the company that I am really impressed with. Not many companies stand by their product for a few years let alone a lifetime and it must say something for X-Arcade to guaranteed their products for life. MAME's my go to application to test out retro parts and I instantly fired up Street Fighter II Championship Edition. To test I played Balrog and Ryu. For Balrog I wanted to see if the unit was capable of functioning when using Balrog's tornado punch. In order to throw the punch, you have to either hold down all three punch or all three kick buttons for a certain amount of time and let go when you want to execute it. You should be able to still throw other punches with the buttons held and the Tankstick did just that. I didn't sense any problems while fighting with three buttons held down and using the other three to throw some punches. Upon letting go of the three punch buttons, Balrog threw his tornado punch with devastating results. I didn't have any problems executing Balrog's special moves which consist of horizontal charging. For rotational moves, Ryu was my choice and I was easily able to fireball and dragon uppercut to my heart's content. I haven't played the game that much in the past few years but I was easily able to dragon uppercut Blanka out of a strong barrel row more than a few times. For this to happen you better be quick and the control better be accurate and I was happy to say the Tankstick never failed on me. I was somewhat inconsistent playing the game on the Xbox 360 with the analog stick and D-Pad but with the Tankstick on MAME, I had no problems pulling off the moves on a consistent basis. Golden Tee and Missile Command were my two choices to try out the trackball and I decided to not lock the trackball for Golden Tee. The feeling of the trackball was very smooth and responsive with the cursor accelerating as it should when i accelerated my spin. Golden Tee worked great and the game translated my bad spins into bad hooks and slices. When I was able to roll straight on, the game reacted accordingly with a straight shot down the fairway. Playing Missile Command with a trackball is a great blast to the past and I was able to control the crosshairs pretty well. I never felt like I was out of control and the trackball was very responsive to all my quick maneuvering. As with their solo trackball unit, the trackball on the Tankstick worked fabulously. X-Arcade supplied a few games with the Tankstick so you aren't left out in the cold if you don't have MAME or other games to play. Atari Classics from Infogrames gives you 12 classic games such as Missile Command, Centipede, Crystal Castles, and Warlords. The Midway bundle that comes along as well has Rampage, Gauntlet, Joust, Robotron 2084, Defender, and Smash TV. All the games encompass a wide range of control schemes and will allow you to experience each aspect of the Tankstick. Of course the best way to go is to pick up MAME and all the wide assortment of games available on that program but it's nice of X-Arcade to include some classics for you to play with. The Tankstick comes in at $200, which is a little less expensive than picking the trackball and stick units up separately from X-Arcade. It's still a little expensive but you get arcade quality and a lifetime warranty. I love the all in one design and the wider length of the unit as well as the feel of every aspect of the Tankstick. With the ability to program the buttons easily, you can really tailor the setup to your needs if the program doesn't have native support. I can't find much to complain about with the Tankstick and the only improvements I can see for the next controller would be to add a dial and perhaps rotatable sticks for games like Ikari Warriors. Overall, the Tankstick's a great peripheral for retro gamers and a few current games out there. The marriage of the trackball and dual joystick setup is perfect and I anxiously await the next creation from the folks at X-Arcade. For you arcade fans out there, this product feels exactly like the real thing. Backed with an incredible warranty, the Tankstick's a great buy for those that want an arcade quality feel for both the joystick and trackball all in one solution.